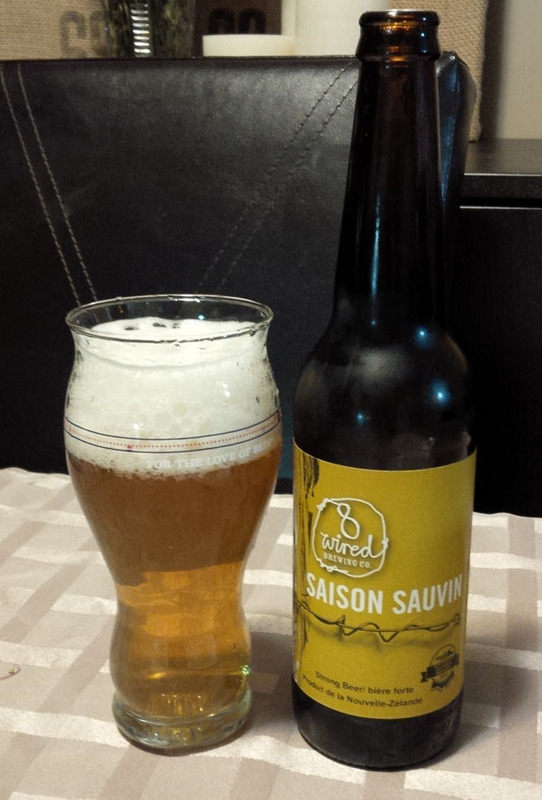 8 Wired – Saison Sauvin: From New Zealand, this saison measures up at 7.0% alcohol and was poured from a 16.9 oz bottle at home. We are getting access to a lot of their beer in Vancouver, BC which is pretty exciting because they offer pretty good stuff. Aroma and Appearance: Pours a clear gold colour with lots and lots of foam, rapid rising bubbles and an aroma of grassy, earthy hops. Flavour: Grassy malts (like a pilsner) with a touch of sour here and there, a nice dry bitter finish accompanied by a light effervescent body that the style is known for and has a flavour similar to some white wines. Overall Impression: If nor for the grassy malts, this could almost be mistaken for a sparkling white wine. This is a good, to style saison with a bit of extra bitterness, a touch strong alcohol level but it isn’t noticeable when you drink it. Rating: I give it a 7/10, good impression of the style and well executed. Personally, I like my saisons a bit spicier, however this is one I would consider having again another time. They drink our beer over there…..
8 Wired make some great beers, I’m glad this was a reasonable introduction. You really have to love Nelson Sauvin hops! Yeah this was a nice one, I have an Imperial Red to review soon (one I love and bought multiples of). We got a good influx of their beer here which is great, I now look for NZ imports specifically whenever I shop for beer.